Event Description In 2014, artists Marcos Ramírez ERRE and David Taylor set out to trace the historical 1821 border between Mexico and the western territories of the United States. That border stretched from the present-day Oregon/California state line to the Gulf of Mexico just west of Louisiana, and previously existed only as a reference on historic maps and treaty documents because it had never been surveyed or physically marked. For DeLIMITations, ERRE and Taylor asked the question, “what would Mexico and the United States look like if that boundary had been fully realized?” ERRE and Taylor, accompanied by filmmaker José Inerzia, who helped document the process, drove a van outfitted to serve as a mobile command center, fabrication space, and camper along the 1821 border. The artists marked the boundary by installing 47 sheet metal markers that mimic the stone and iron obelisks that delineate the current international border between the United States and Mexico. Event Description In his Hermoso Paisaje series, Moris creates makeshift shelters and furniture using found materials such as garbage, tarps, and cardboard. These installations are made from the material remains of the urban landscape they recreate. Informed by art history, ethnography, and activism, the artist’s works are almost portraits of the city, capturing their wastefulness. 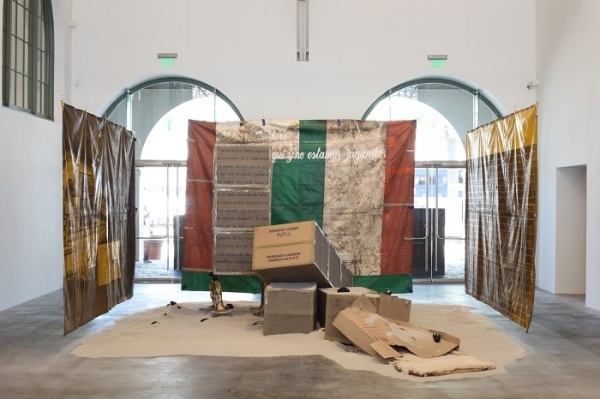 In this site-specific work created for the MCASD exhibition Viva la Revolución in 2011, Moris references the utilitarian recycling of societies where inhabitants are forced to reuse materials due to unsustainable growth and eroding infrastructure. Moris draws on tarps by erasing and washing away dirt and soot to reveal various cultural and architectural images. Event Description Papel Chicano Dos: Works on Paper from the Collection of Cheech Marin presents artworks by Chicano artists including established figures such as Carlos Almaraz, John Valadez, and Margaret Garcia, as well as younger emerging artists such as Wenceslao Quiroz and Carlos Donjuan, whose work demonstrates a range of techniques from watercolor and aquatint to pastel and mixed media. 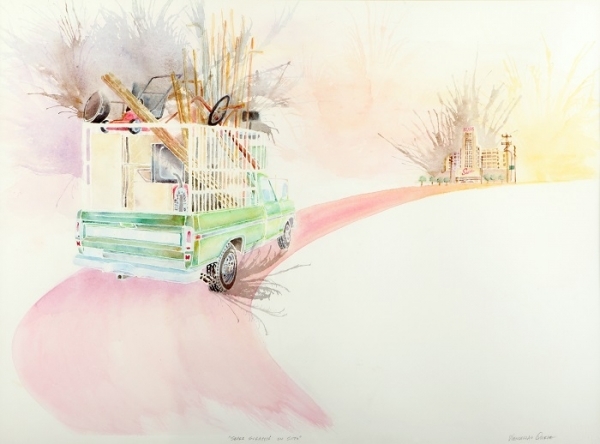 The visual arts were integral to the Chicano movement of the mid-1960s and continue to be a powerful tool for Mexican-American and Chicano communities to voice the issues that affect them today. The works’ emotive images draw on myriad sources, such as pre-Hispanic symbols, post-revolutionary nationalistic Mexican motives, and contemporary urban culture. Together these pieces evince a special focus on activism—highlighting how Chicano artists provide access to the arts by creating posters, flyers, printed statements, and newsletters with elaborate aesthetic compositions and designs. Event Description Ruben Ochoa makes use of common construction materials to create imposing sculptural installations that intervene into the existing built environment. His sculptures—in addition to his drawings, photography, and public projects—move beyond the materials’ direct references to construction and labor in order to generate new associations between aesthetics, architecture, and class. Part of a generation of Mexican-American artists who are engaging in new approaches to identity and cultural politics, Ochoa lays claim to conceptual and minimal art practices from the 1960s and ‘70s. As playful as it is dynamic, his large-scale installation watching, waiting, commiserating was commissioned by MCASD in 2010 as a response to the expansive Farrell Gallery. 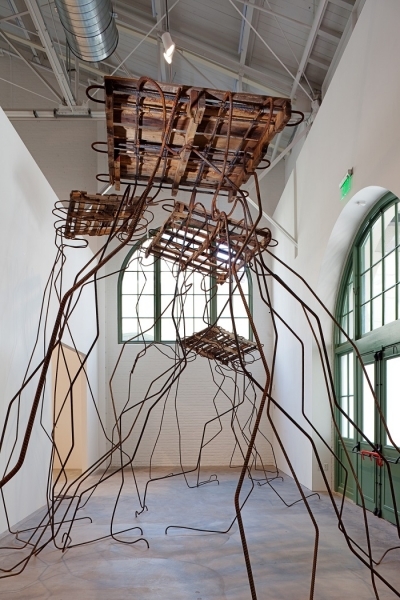 Consisting of numerous individual sculptures made of rebar and elevated shipping pallets, the work repurposes the infrastructure of the built environment, creating a space where labor is both literally enacted and abstractly referenced. Event Description Sergott Contemporary Art has the pleasure of presenting Neo-Kitsch: a New Old Latin America, an exhibition presenting six Latin American artists who utilize kitsch objects and symbols to refer to the colonial, social, cultural, and political history of Latin America past and present. Kitsch is often considered to be gaudy or ironic, but in Latin America, it represents a long cultural history of each country and acts to remind the viewer of a forgotten past. Examples of kitsch items may include indigenous handcrafts, or tropical fruit and animal sculptures. 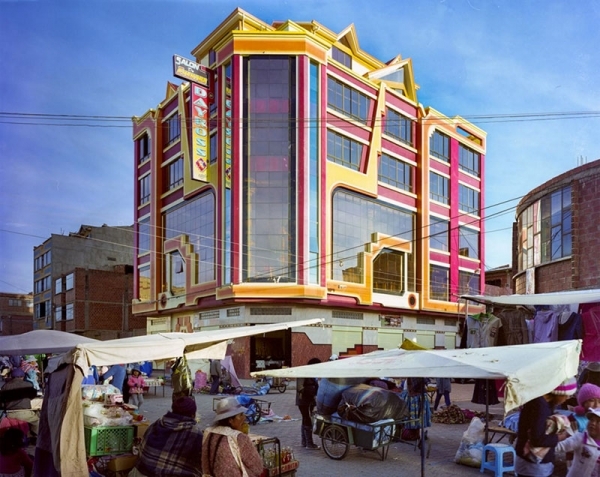 The artists presented in Neo-Kitsch explore their identity, art history and culture through their use of imagery, often introducing bright colors and objects. “I am excited to introduce Latin American artists to the San Diego region and look forward to presenting works that extend beyond our southern border and present a wider Hispanic perspective,” says Thomas Sergott, the founder and director of the gallery. Event Description Join us this Friday and Saturday for an exclusive trunk show with The Collectors’ Gallery featured artist, Sarah Myriam Winston. Her natural dyed and handwoven textiles have the movement and softness of the human hand interlaced in their fiber. Come meet Sarah and learn more about her time intensive processes while shopping her newest scarves, garments and accessories.